How is your morning going? It's the 25th today and Thanksgiving is coming soon, so I thought it would be nice to post a fall/thanksgiving recipe for you guys! 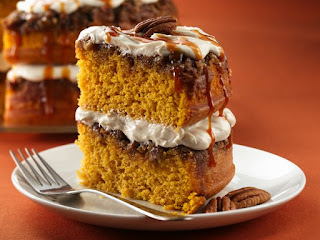 This dessert is called "Praline-Pumpkin Cake" and let me tell you, its so DELICIOUS! A perfect dessert to serve at your holiday parties for your family and friends. I adore the simple yummy ingredients! Here is how to make it..
Cake mix and purchased frosting pair up with some extras to create a scrumptious pumpkin and praline indulgence. Heat oven to 325°F. In 1-quart heavy saucepan, stir together butter, whipping cream and brown sugar. Cook over low heat, stirring occasionally, just until butter is melted. Pour into two ungreased 9- or 8-inch round cake pans; sprinkle evenly with 3/4 cup pecans. In large bowl, beat cake mix, pumpkin, water, oil, eggs and 1 teaspoon of the pumpkin pie spice with electric mixer on low speed until moistened, then on medium speed 2 minutes, scraping bowl occasionally. Carefully spoon batter over pecan mixture in each pan. Bake 41 to 47 minutes or until cake springs back when touched lightly in center. Cool 5 minutes; remove from pans to cooling rack. Cool completely, about 1 hour. Stir remaining 1/2 teaspoon pumpkin pie spice into frosting. To assemble cake, place 1 layer, praline side up, on serving plate. Spread with half of the frosting. Top with second layer, praline side up; spread remaining frosting to edge of layer. Drizzle with caramel topping and additional pecans. Store loosely covered in refrigerator. Cool layer cakes in their pans on cooling racks for 5 minutes. This keeps the cake from breaking apart while it's too warm and tender.